At this page you can find some of software myself or other Crocodile Group members wrote. Most of the software here is freeware, for Unix-like operating system, provided with full source code under GPL or BSD licence. Some utilites are just small handy scripts while others are links to a bigger software projects. Substantial part of this software is rather old and have mostly historical value. All software listed below is free. Few people send me questions, asking how they could thank me for developing it. Best thing you can do is to improve this software and send your modifications back to me. No, I do not want any money contributions. If you really want to send me something, visit my Books Wishlist. filter_news This small utility take the news in batch mode according to config files. It takes only articles, whose match regexp specifyed in config. Good if you are looking for somthing specific in Usenet. iftelnetd This is small daemon allows you to connect from any FIDO mailer running under OS/2 with VMODEM driver to ifmail. ppm2face PPM to FACE convertor. To be used with compface utility to add your face to you email header. Clever programs like Zmail or UMT can show it. Tube If you are behing firewall and have only 'TELNET' command to access outside world this utility could be used to tunnel other TCP protocols over it. Sinetd This is a simple inetd like server which can be used to lauch some application which is supposed to be run from inted in case when you do not have root acces to configure inted. The typical example is POP server. Simpleproxy This is a simple tcp proxy which allows you to forward tcp connections from one host to another. It also works though HTTPS and can do very simple POP3 users filtering. Zprint Small utility to print files from you Zaurus using Unix box as print server. ZETRIS This is TETRIS like game I wrote for Zaurus PDA. WProlog These are my extentions/modifications of Prolog language interpreter written on JAVA language. It can be used as embedded Prolog engine within JAVA applications/applets. Original W-Prolog page can be found here. ICQMail This is a simple ICQ client which forwards all messages to given email address. xferlog Tiny CGI script to print FTP server statistics. 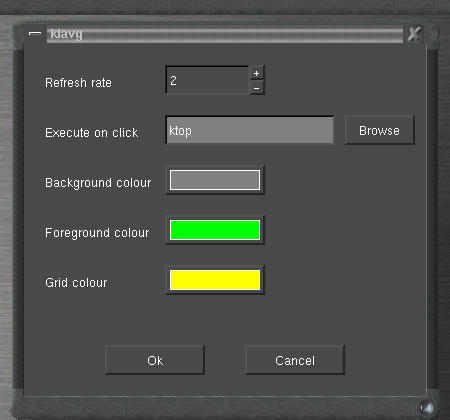 klavg Small KDE applet showing load average graph on the panel. Here how it looks in panel and here is preferences dialogue. icmpmonitor Using the InterNet Control Message Protocol (ICMP) "ECHO" facility, monitors several hosts, and notify admin if some of them are down. exif2csv Quick hack of exifdump utility to produce output in CSV formmat. It could be used to extract image info stored by digital camera in the JPEG images. ArithDrill Small applet for children to train basic arithmetic skills. You can see it in action here. GenSheet Small perl script to generate PostScript document with several pages of arithmetic tests for substraction and addition. You can see sample resutls here and here. photoarchive Personal WWW photo archive. Uses RDBMS to store all data. linksys2syslog Small utility to catch SNMP traps sent by Linksys EtherFast Cable/DSL Router (model BEFSR11) and writes them to unix syslog. Firewall Builder Firewall configuration tool with GNOME GUI, XML data presentation. Support multiple firewalls. Length Converter Smart converter between metric and US length units. Back to Crocodile Group WWW Server.